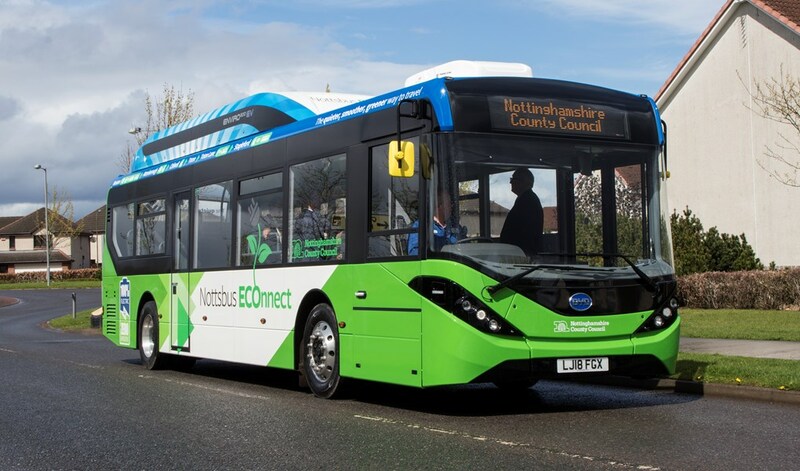 The first of the BYD ADL partnership’s 10.8m long Enviro200EV electric buses in provincial specification have been handed over to Nottinghamshire County Council (NCC) and will enter service on 4th June 2018. The two buses will run on routes 510 (Beeston Bus Station to Stapleford Memorial Gardens via Toton Park & Ride) and 511 (a loop shopper service from Stapleford Memorial Gardens). The services run 12 hours a day from 07.00, six days a week. The single deck BYD ADL Enviro200EV buses, funded by the Office for Low Emission Vehicles (with a total of £910,000 funding from the Government and NCC), have 36 seats with an overall capacity of 70 passengers. Nottinghamshire County Councillor John Cottee, Chairman of the Communities and Place Committee, said: "This is a significant moment for public transport in our County with the first electric buses due to serve local communities in the Stapleford, Toton, Beeston and Attenborough areas. "These buses built in Falkirk by Alexander Dennis Limited in partnership with BYD are at the forefront of the 'green' revolution in zero emission bus technology and will help improve air quality and reduce CO2 emissions, as well as informing future fleet investment decisions by the County Council." Speaking on behalf of the BYD ADL partnership, Frank Thorpe, BYD’s UK Country Manager, said: "These two vehicles demonstrate the attractive features of our joint design for use on provincial services. We are anticipating many more orders for this now well proven combination of ADL’s stylish bodywork and BYD’s advanced pure electric drivetrain."